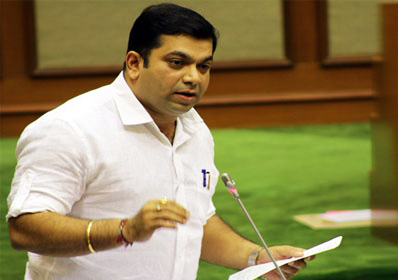 The newly appointed Lokayukta of Goa got a first case of corruption today, involving tourism minister Dilip Parulekar in an alleged multi-crore beach cleaning scam. Porvorim independent MLA Rohan Khaunte, in a complaint, has also cited defence minister Manohar Parrikar as a ‘witness’ in the case. Pending investigation, Khaunte has also demanded that Parulekar be dropped from the ministry to face a fair inquiry. “I really do not understand why Mr Manohar Parrikar, after knowing that the tender is messed, allowed his Tourism Minister to defraud the exchequer to the tune of Rs 14 crore”, states Khaunte. According to the opposition MLA, there are two scams involved in one beach cleaning case: 1) Rewarding beach cleaning tenders in a fraudulent manner, and 2) continuing with the same contractors even after the contract tenure is over. He has thus demanded that the contract be terminated immediately, failing which he would approach the high court to get the contract continuation stopped. Besides Parulekar, Khaunte has also made various tourism directors and deputy directors as well as both the contractors as conspirators in the scam. The prime charge is that Parulekar has received kickbacks in awarding the beach cleaning contracts to Bhumika Cleantech Services Pvt Ltd and Ram Clearners and Developers Pvt Ltd. According to him, both the contractors, having same directors and same office premises, have not taken up beach cleaning work as prescribed in the contract and beaches have been left dirty in spite of paying them crores of rupees. In order to accommodate both these contractors and disqualify the local contractors, the bar of eligibility was raised to Rs 10 crore turnover, in order to have mechanised cleaning. “However, smartly the mechanized cleaning was (subsequently) done away with and the tender was continued with the same party with manual cleaning”, states Khaunte. He also claims that there are extensive reports by various information assistants in the Department that there was no beach cleaning work done at various beaches. In addition, he says distances of the beach length and width are fraudulently altered to raise the billed amount, thereby looting the exchequer. “All this has been done by the accused by overriding the objections of various officers. I have got a plethora of documents to support the complaint”, claims the Porvorim MLA. He has also alleged that many notes on the files have been suppressed and destroyed while hiding several facts during the debates in the Assembly over the issue.